Email Marketing is one of the best methods to grow traffic to your website and grow your business. Are you kidding me? Isn’t Email Marketing dead already? People still send and read emails. In fact, email is the most efficient channel to reach to your customers. Unlike Ads and Social Media, where you promote your products/posts to the random people with the hope of getting leads and then the conversion, you already have the leads that are interested in your products in email marketing– why would they subscribe to your email list if they didn’t like you? So, you should start collecting emails from your visitors so that you can drive traffic from email and grow your loyal fan base. 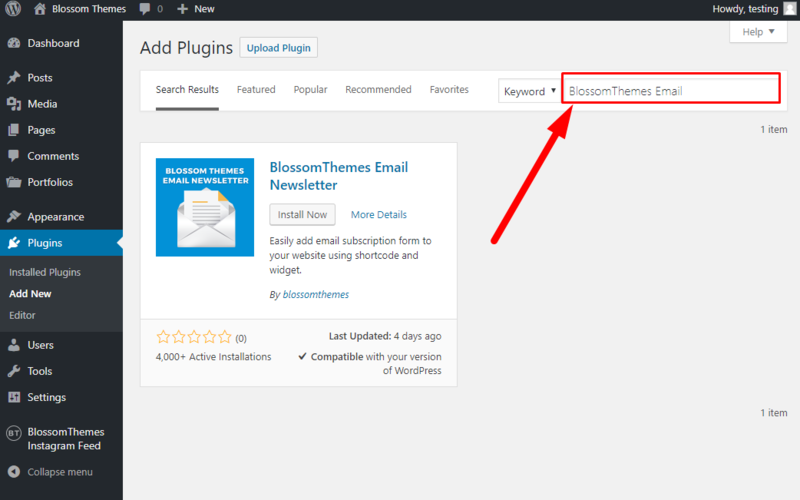 If you are using WordPress, BlossomThemes Email Newsletter plugin will make email collection easier for you. BlossomThemes Email Newsletter plugin is a customer acquisition and email marketing plugin that you can use to add email subscription form on your blog. 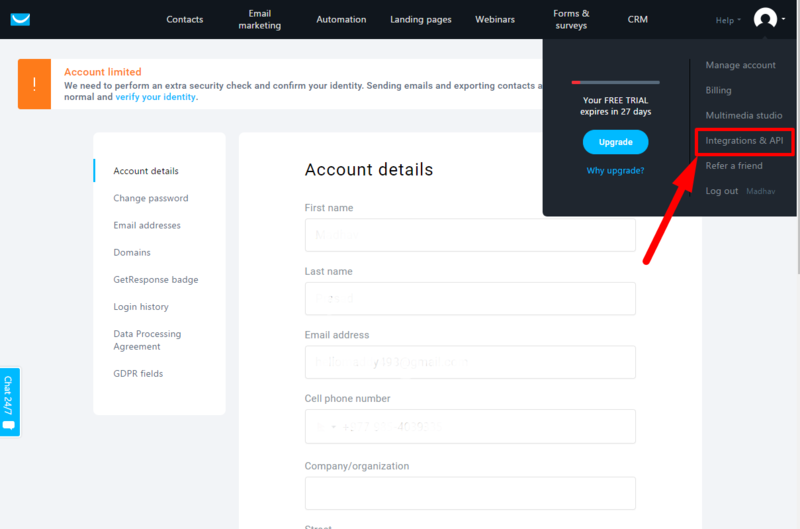 You can use this plugin to grow your email list and gain leads for your business by displaying a targeted message on your website/blog. 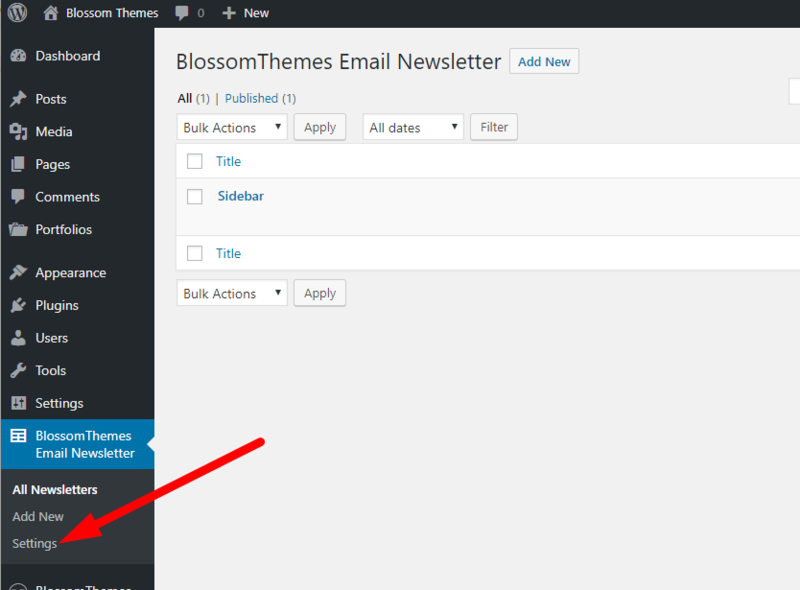 BlossomThemes Email Newsletter is completely free. The plugin supports popular email marketing platforms like MailChimp, ConvertKit, MailerLite, and GetResponse. You can create unlimited subscription forms. You can display the targeted message to your audience. 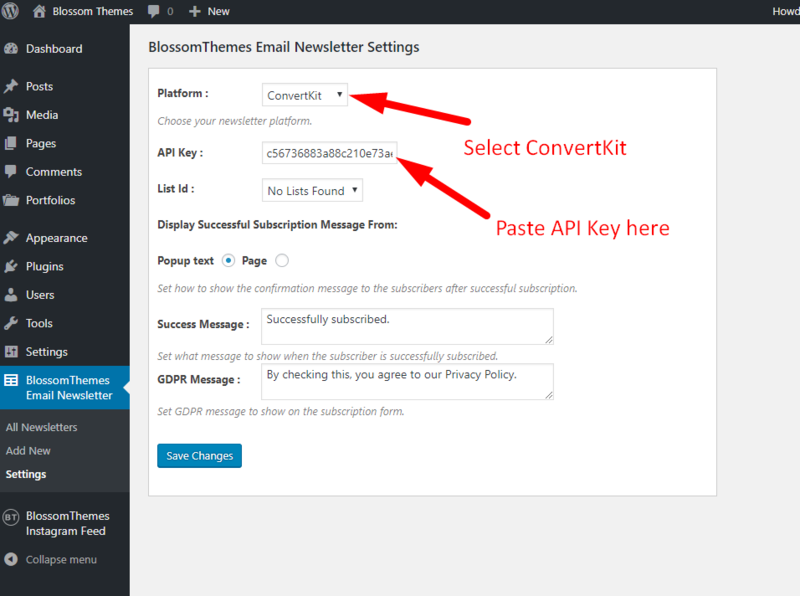 In this article, we will talk about how you can integrate BlossomThemes Email Newsletter plugin on your blog and connect it with popular email marketing platforms like MailChimp, ConvertKit, MailerLite, and GetResponse. 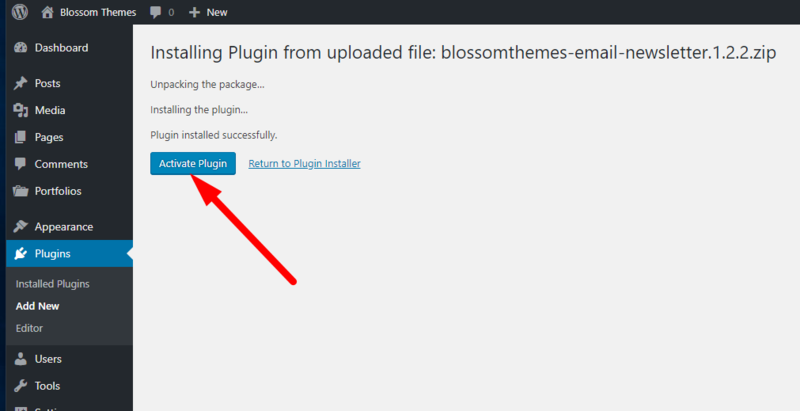 You can install the plugin directly from the WordPress repository, or you can download the plugin here and upload it to your WordPress admin dashboard. We recommend using the WordPress repo method so let’s begin. 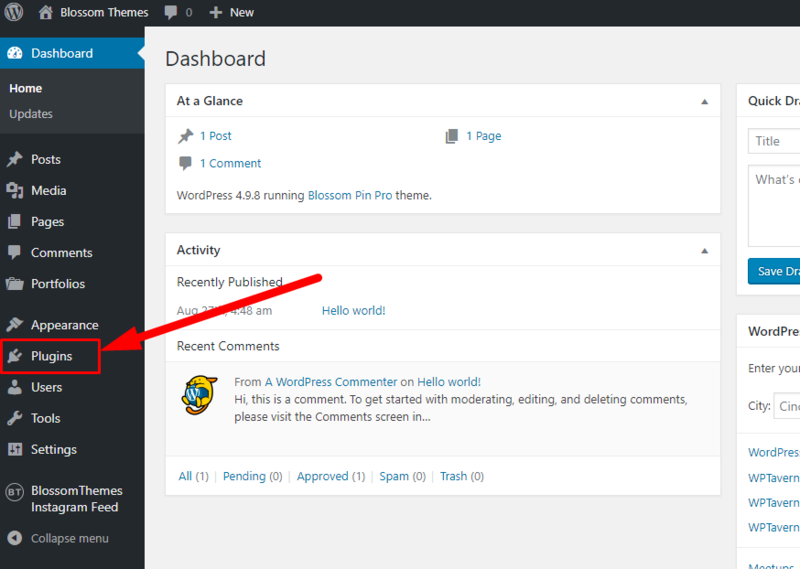 Log in to WordPress Dashboard and go to Plugins. 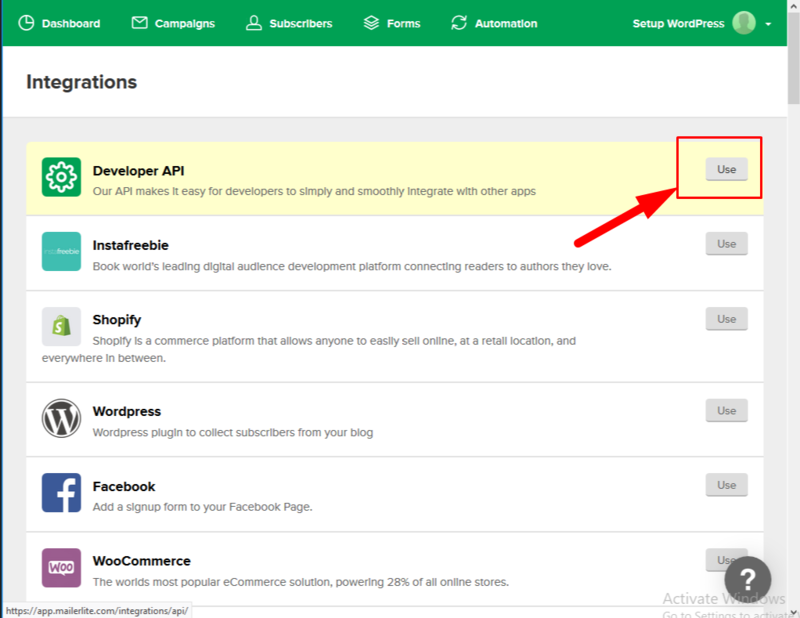 Once the plugin is installed, click on Activate Plugin to activate the plugin on your website. 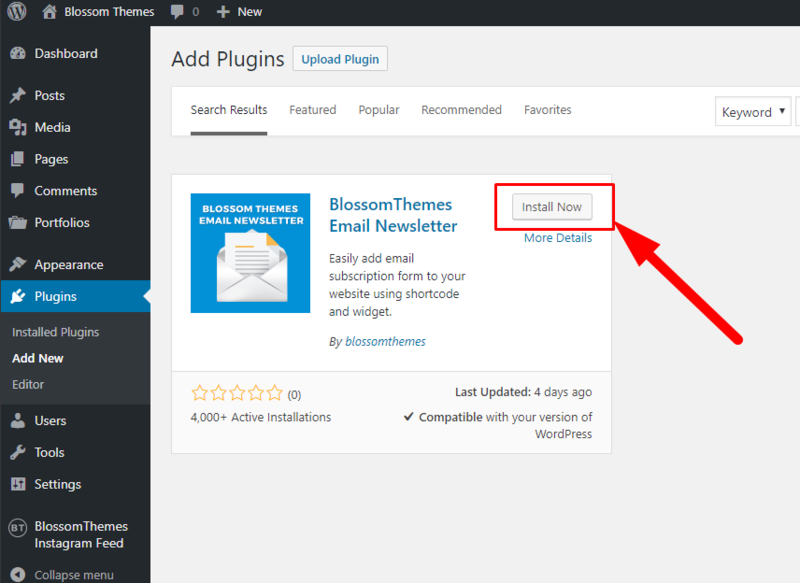 Once the plugin is activated, you will see a menu “BlossomThemes Email Newsletter” added to your WordPress Dashboard. 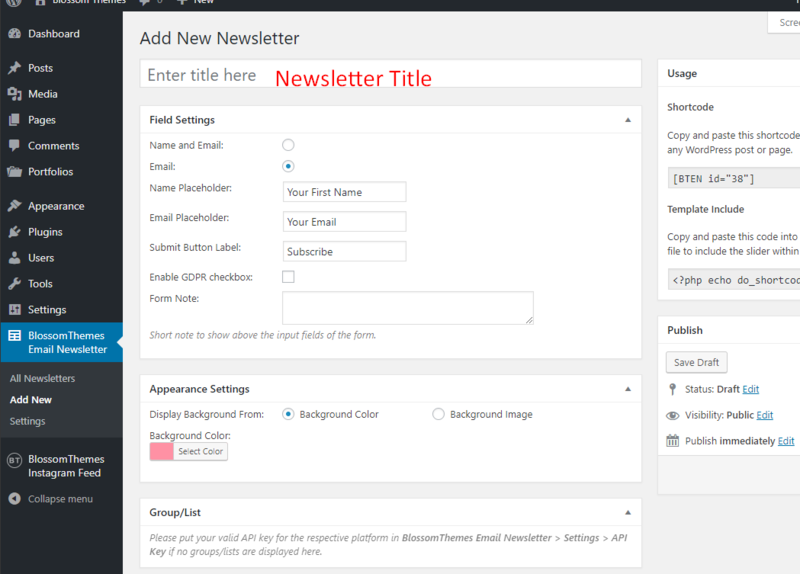 You can configure the newsletter form from this menu. 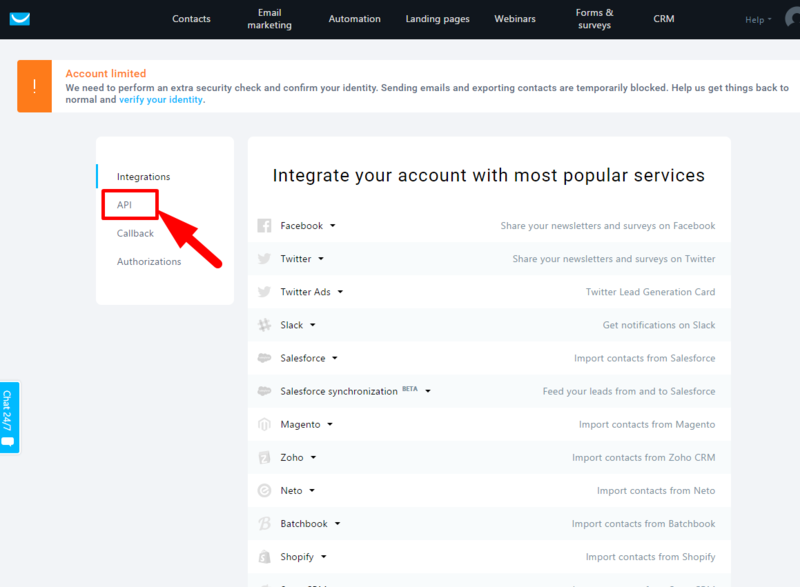 Now, let’s set up the subscription form on your website so that your visitors can subscribe to your newsletter. 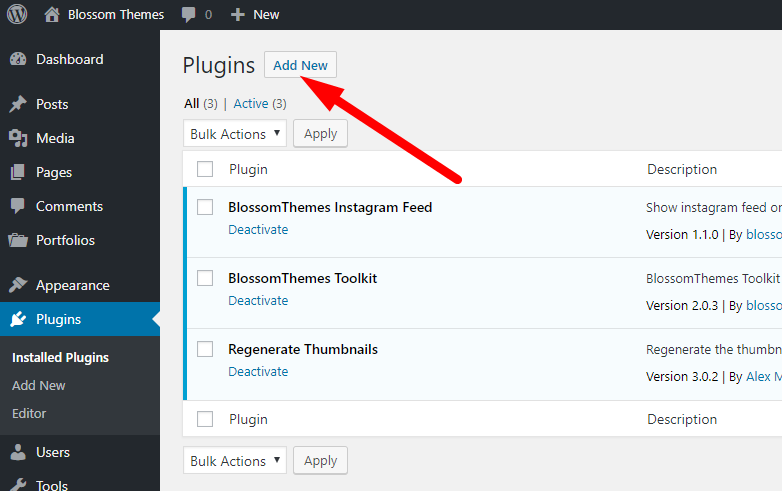 Go to BlossomThemes Email Newsletter on your Admin Dashboard and click on Add New. Enter the Newsletter Title. Title works as the name of your newsletter form. This title is used to identify your newsletters. Select the fields you want to display on the Newsletter form. You can choose “Name and Email” or only “Email”. Enter the placeholder for Email and Name. 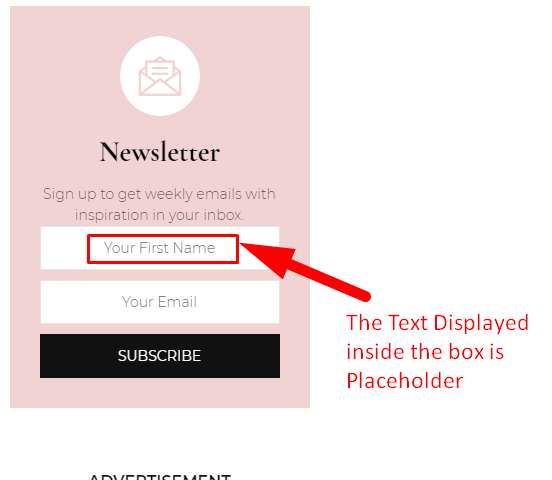 Placeholder is the text displayed inside the input box. Click on the enable GDPR checkbox to enable GDPR notice. GDPR is a regulation in European Union law on data protection and privacy. If your targeted audience lives in Europe or is a citizen of one of the EU nations, you must enable GDPR on your website. Enter the Form Note for the subscription form. Form Note is a short message displayed on the Subscription form. Choose the Display Background for the subscription form. You can choose from various colors, or you can even upload an image for the background of the subscription form. Choose the option that fits your website. Once the subscription form is created, copy the Shortcode. 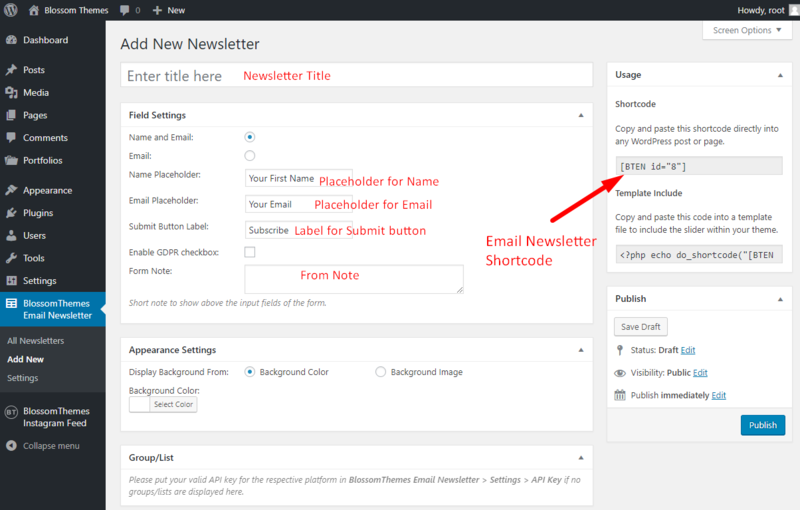 You will need the shortcode to display the newsletter on different sections of the Blossom Themes’ themes. 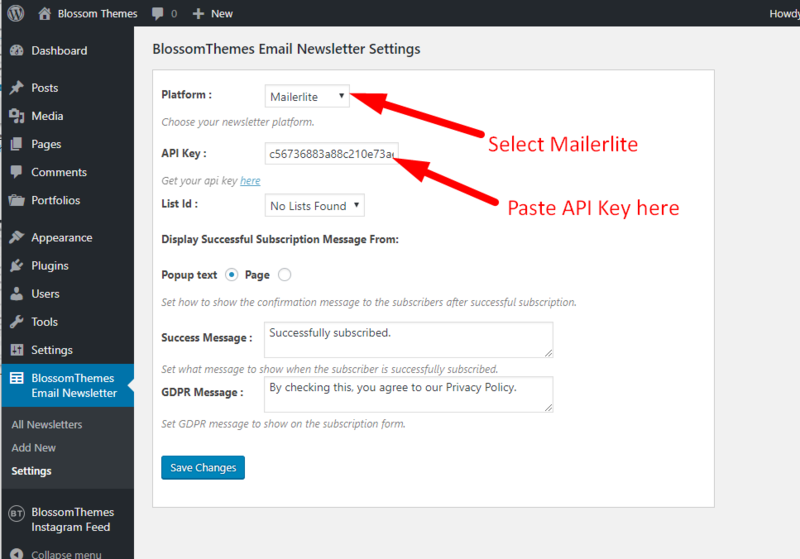 You can integrate different email marketing platforms such as MailChimp, Convert kit, Mailerlite, and Getresponse with BlossomThemes Email Newsletter plugin. Click on Create a Key. You will get an API key. Copy the API Key and paste it somewhere handy. 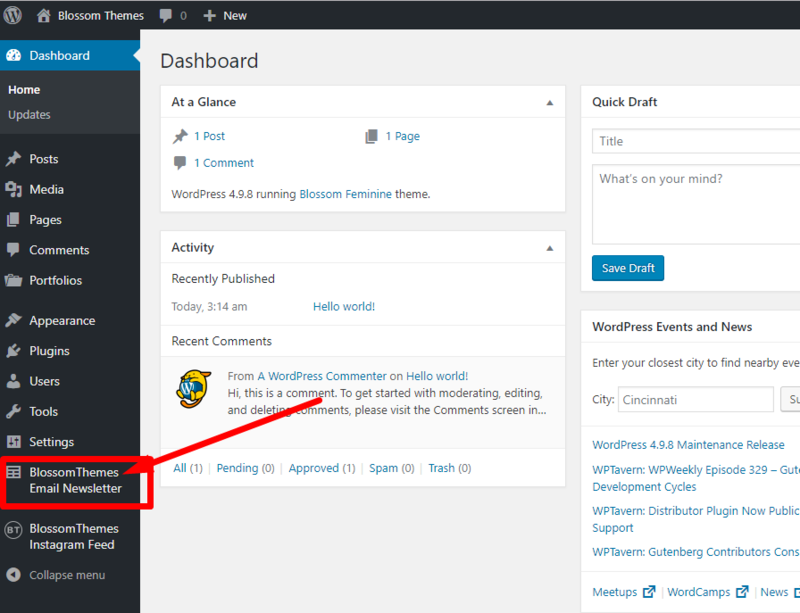 Then, log in to your WordPress Dashboard. 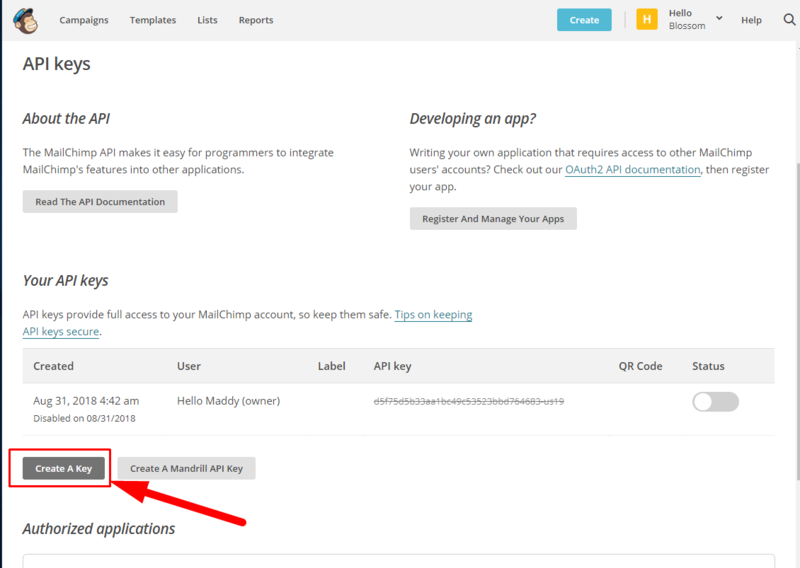 Select the Platform as Mailchimp and paste the API Key from your MailChimp account. 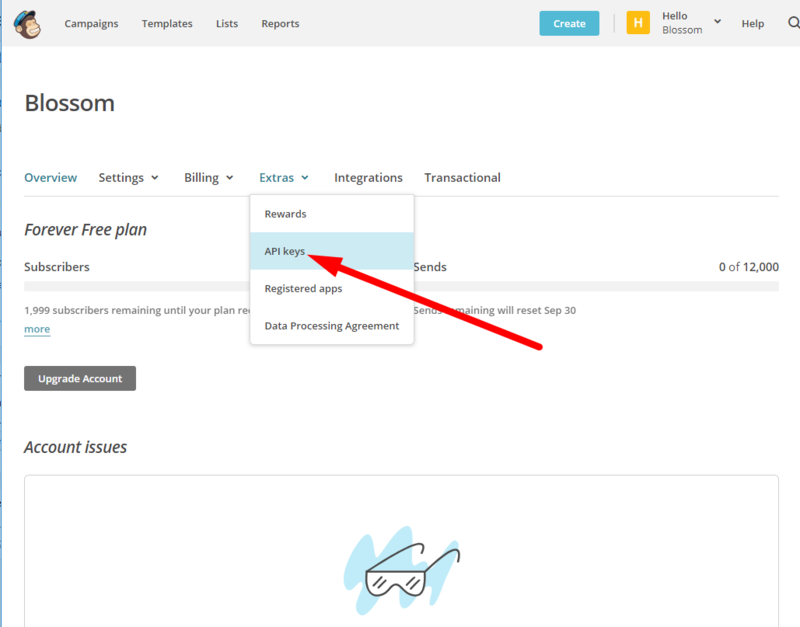 If you have an email list on your MailChimp account, you can also select the list that you want to add new emails to. 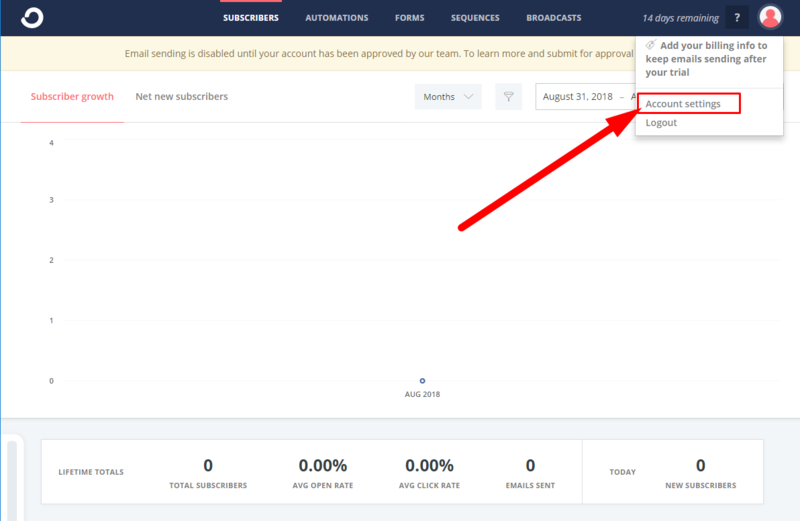 Check Confirmation if you want subscribers to receive a subscription confirmation email. Choose where you want to display the Successful Subscription Message. You can select a popup text or navigate to a page. Enter the Success Message and GDPR Message if you have enabled GDPR. 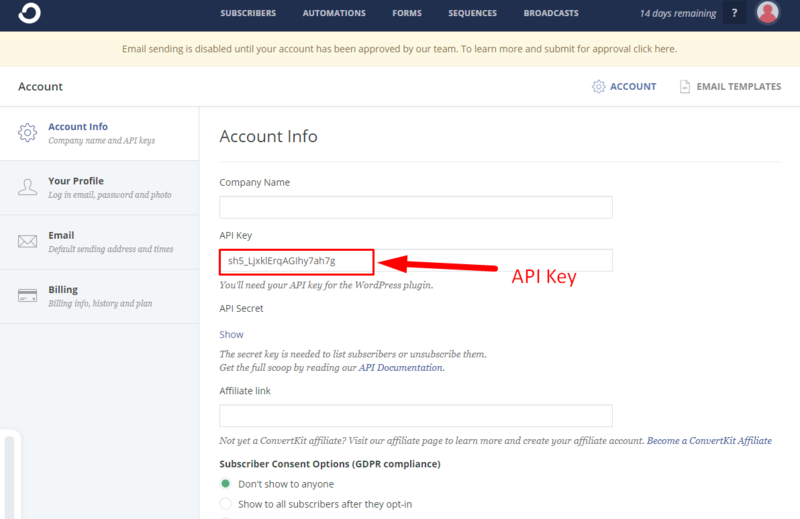 Select the Platform as ConvertKit and paste your ConvertKit API Key. 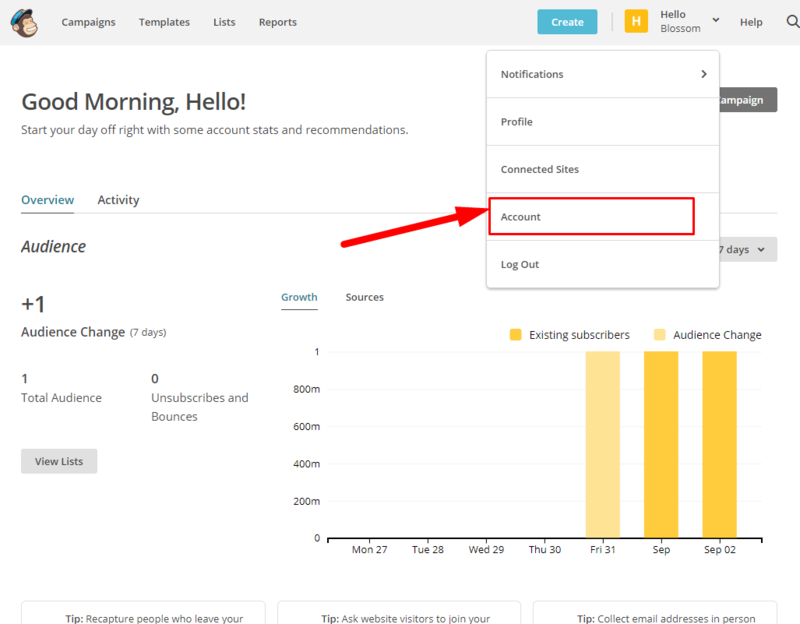 If you have an email list on your ConvertKit account, you can also select the list that you want to add new emails to. Copy the API Key and place it somewhere handy. 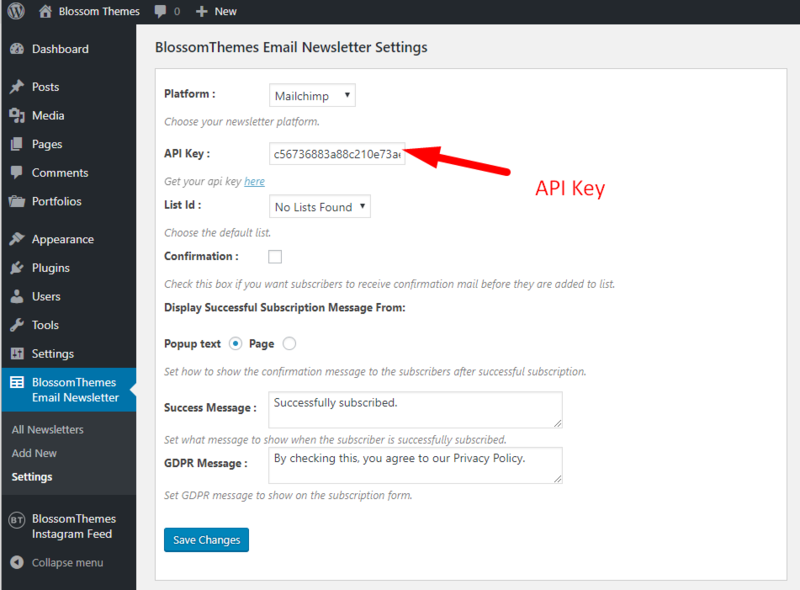 Then, log in to your WordPress admin dashboard and click on BlossomThemes Email Newsletter menu. 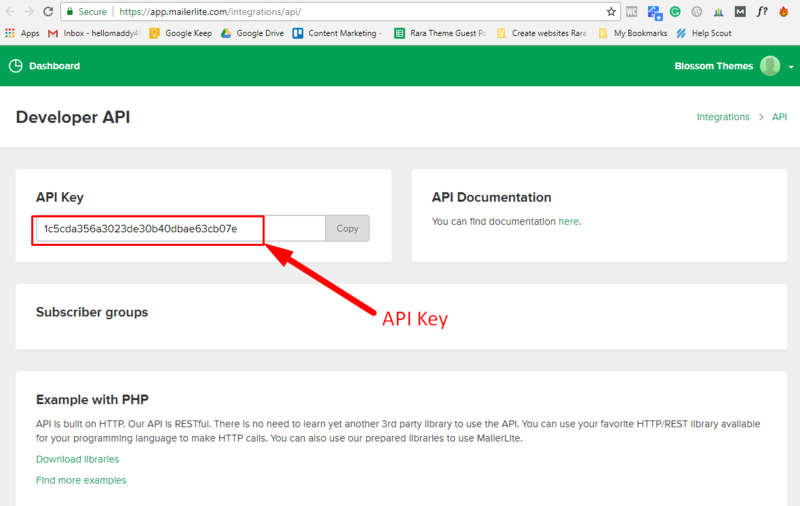 Paste the API Key from your MailerLite account. If you have an email list on your MailerLite account, you can also select the list that you want to add new emails to. 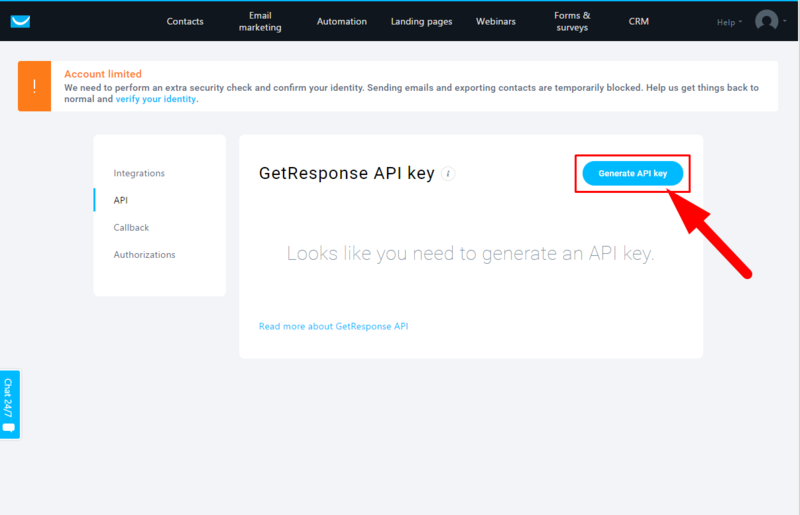 Paste your GetResponse API Key. 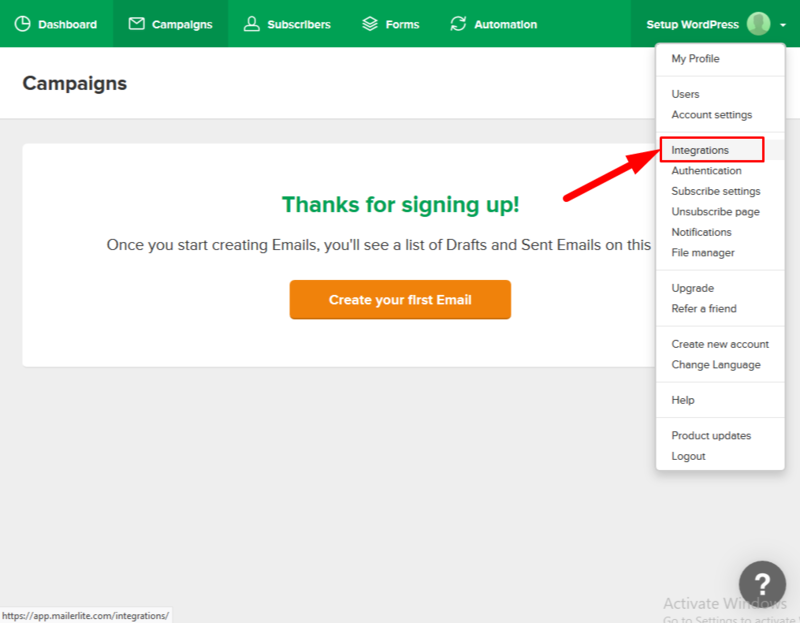 If you have an email list on your GetResponse account, you can also select the list that you want to add new emails to. 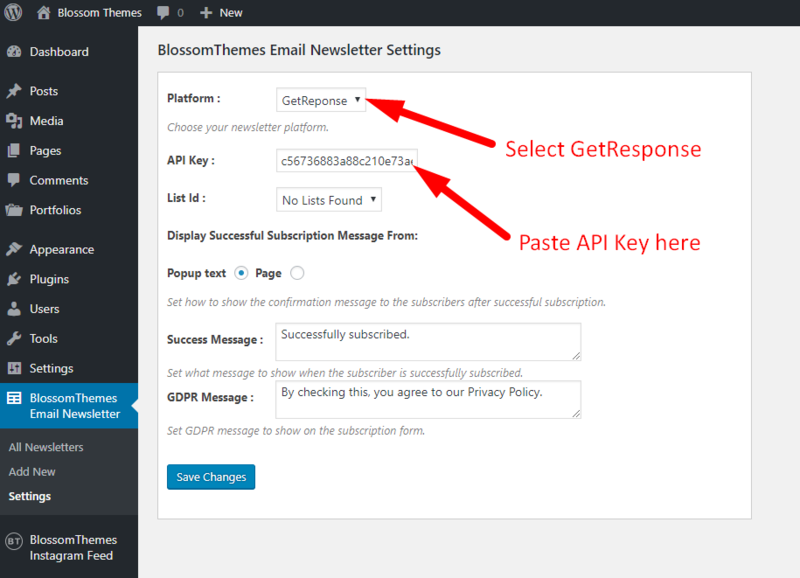 If you had troubles and need help integrating your email marketing platforms with BlossomThemes Email Newsletter Plugin? Blogger vs WordPress – Which is Better for Money Making Blog? Some of the tips and support that I am going to discuss below have also been previously discussed in my How to Start a WordPress Blog post. So, you might want to check that out to understand in-depth what it means to have your own self-hosted WordPress blog. If you have already done that, read on! You have decided you want to start your own blog. You know you can make money online solely through your blog. But the question remains: What is better for you and your goals, especially for making money? Blogger (Blogspot) or WordPress? If you have ended up asking yourself this question too many times, don’t worry – you are not alone. This is one of the most common questions that I get asked. Most people seem to be confused about which is the right platform to choose. More importantly, they are not sure if they really want to make a switch from one platform to the other. I know because I myself have been there. For a long time, I used Blogger. And, I have to admit, I was a bit afraid initially about making a switch to WordPress. But once I realized what I was losing with Blogger – mainly because of the lack of complete control over my blog and reduced opportunities of making money – I quickly decided that I just had to move on to WordPress. Needless to say, there has been no looking back ever since. So I want to explain and address this common confusion and also give you some easy and simple steps so that you too can smoothly and comfortably make that switch from Blogger to WordPress. However: If all you really want to do is create a completely new blog right from the start, and you need not bother about moving all your old blog posts to the new one, you can just simply follow the steps given in our How to Start a WordPress Blog post. By following these steps, you can create your own self-hosted WordPress blog (through our Bluehost link, it’s cheaper too!) and start making money online. Just remember to make a new post on your old blog to update your followers that you are moving! Now, first: let’s get started by understanding why you might want to move away from Blogger to WordPress. If you ever want to start making money off your blog, you must start your own self-hosted blog through trusted services such as Bluehost. Most bloggers recommend on having self-hosted WordPress blog, and this article will support you so that you can easily start your own WordPress.org blog. Remember: this should not be confused with the free version “WordPress.com” blog. Those blogs, including the free version from Blogger, are never a good idea if you want to monetize your blog. There are many problems associated with having a blog on these platforms. First problem – the advertisers, companies, and your readers and visitors, who are crucial for your money-making, will easily recognize that you are using Blogger or free WordPress. You will straight off come as unprofessional. Period. Second problem – and perhaps the most disastrous one! – is that there is no telling when your blog might be deleted for no explainable reason at all! If this happens, you don’t just lose your precious works but also seriously hurt your chances of making a stable income from your blog. Even buying your own domain name for $10 from Blogger or GoDaddy will not guarantee that you completely own your blog! So why deal with all the hassle? It is always a smarter idea to simply have a self-hosted WordPress blog, and increase your chances of earning good money through it online. Still, don’t believe this is possible? Just check out these amazing bloggers who are already making around $1,00,000 in revenue every month! Trust me, if you ever want to blog for a living, then WordPress is your ultimate answer! Looking to simply start a new blog of your own? You may first want to check out our other article that provides a complete and easy-to-follow guide on how to start a WordPress blog of your own at the cheapest possible price. You can also find our Bluehost link, which you can use to sign up for hosting for at least 12 months and get discounted rates starting $3.49 per month along with a FREE blog domain worth $15! I hope now you know why WordPress blog is THE place to be. That means you are ready to start your own WordPress blog or to migrate your Blogger blog to WordPress. With this easy-to-follow guide, you don’t need to worry even if you are not well familiar with the process. Just read these simple instructions on How to Transfer a Blog From Blogger to WordPress and follow the steps provided. Making the switch may not feel like something that is for you, but WordPress is definitely the place where you would want to be – hands down! Many people are hesitant about making the transfer from Blogger to WordPress, and understandably so. But once you make that move, you’d definitely realize just how advantageous this is. Don’t be surprised if you feel like you should have made the switch sooner! Still confused on whether WordPress or Blogger is the better one for you? You can always go back to the several benefits of being on WordPress that we have outlined above and think it through. Now: if you DO want to be on WordPress, just a quick tip for you – make sure you backup your blog and all other relevant things before making any major changes. It’s always a good idea to be careful, just in case you mess up something and would like to have all your work back. Sometimes, you might want to go back to the old blog posts because they might not show up the same way after making the transfer. The first thing to do after deciding to make a switch to WordPress from Blogger is to get your domain. Already have a domain? Great! You can just skip to Step 2. If you are looking to buy a new domain then you can use our Bluehost link to get the web hosting service for a cheap and discounted price upon purchasing a hosting plan of 12 months or more. If you do so, you can also get your domain for FREE through Bluehost. After getting your domain ready, the next step for your Blogger to WordPress migration is now to get your web hosting so that you can have a self-hosted WordPress blog. You can choose from a range of hosting services, but it is generally preferable to do it through some of the more tried and tested services such as Bluehost, which is one of the highly recommended hosting companies by many bloggers. With Bluehost, you get the most affordable service starting from $3.49 per month. That means at just around $60 a year, you can have your self-hosted WordPress blog – and it will be even cheaper if you pay a lump sum for a year upfront. You can also pay it month-to-month basis but you will end up paying twice as much! Remember: signing up for web hosting plan of 12 months or higher is the cheapest way to start your self-hosted WordPress blog… and you even get a FREE blog domain with Bluehost! Go to Bluehost and click Sign-up button. Click I have a domain name or create your domain name directly through Bluehost. Enter the requested information and select your desired hosting plan. This enables you to now have your own self-hosted blog, which is the most definitive way of making good money online. This also means that now you are more in control of your blog – you can do whatever you like and there is more freedom to customize than with free Blogger or WordPress.com blogs. You can also download any theme and give your blog the outlook that best suits your purpose. Or, why not try some of our easy-to-use and customizable themes from Blossom Theme? You can always explore through several of these beautiful themes collections and choose the one that best suits your blog’s personality. Now that you’re on your self-hosted WordPress blog, you can also run your own advertisements, affiliate links, or direct advertising. But, most importantly, you are now all set to start monetizing your blog! Note: If you want to connect your already existing domain with your new hosting service, visit our post on How to Start a WordPress blog and follow the easy process given in Step 2 and Step 3. In earlier steps, you have made all your preparations to now actually start migrating your Blogger blog to WordPress. This is a crucial part, but, nonetheless, easy and simple to follow. First: when logged into your WordPress account, find the left-hand sidebar and go to Tools. After that, click on Import and select the “Blogger” option. You might be asked to log into Google if you’re already not logged in. You will have to grant access to your Blogger information to WordPress, simply click Grant Access to continue. You will have a list of all your blogs. Choose the blog that you want to migrate and click the Import button. You will be asked to wait while the posts and comments are being imported. Click the Set Authors button. Select the appropriate mapping for the authors. Review and check your categories, posts, and comments. Please note that some of the links from your old post might be broken because of your old post structure. To avoid this, you must have the same Permalink structure. Remember: if your Permalink structure was something else, then you should click on that option instead. Mostly, it will be the Custom Structure that we mentioned above, if you are migrating from Blogger. Google penalizes those sites that have posts or pages that are same as another website. So, you would want to revert all of your old Blogger posts to Draft form, so that you don’t end up with two same posts on two websites. However, you must do this only after your site is completely ready. Also, do NOT delete your old posts. You would want to go back to them just in case you made some error during the migration process. Also, your images would still be on Blogger so you should not delete your old Blogger blog. You can simply let it be there. As long as the posts are in the Draft mode, it won’t make any difference. Do not forget – before migrating everything from Blogger to WordPress, you would want to make sure that your readers or audience are informed about it. Take time to make a post about your new domain so that they can always follow you. Also, remember to update your feed and eliminate the risk of losing your valuable subscribers. It is very important that you are able to redirect your followers to your new domain. Making the decision to move from Blogger to WordPress is often difficult for most people. Mainly because they believe that the task ahead of them is too daunting. But – now that you know the numerous benefits and financial advantages of having your self-hosted blog on WordPress rather than Blogger or free WordPress.com version, you should not have any second thoughts about this. Starting a blog on self-hosted WordPress is simply more advantageous and profitable. Not only do you get to monetize your blog through various advertisements, affiliate links, or direct advertising, you also get to customize and control your blog as you please. Check out these beautiful theme collection from Blossom Theme, which you can easily use and customize to best suit your blog. Feel free to take your time with our simple guide provided above, then make that important switch to WordPress in a few easy steps, and start enjoying blogging like never before! Perfect. Because that means you already know how it has changed the life of hundreds and thousands of bloggers and content creators all over the world. In fact, today there are bloggers who are making more than $100,000 a month through their blogs. And besides earning such unimaginable sum of money, they are also able to work from home, travel while they work, set up their own flexible working schedule, and just get more out of their life every day. Not really. You’d be surprised just how easy and effortless it is to create your own blog for just a few dollars of your money. In a few simple steps, anyone can start their own money-making blog and get back the little money they invested in blog hosting in no time. There is no doubt that paying for blog hosting in the initial stages is highly beneficial and worth your every dollar. If you want to set up your own WordPress blog for little cost and maximum benefits, choosing Bluehost for your hosting needs is highly effective. I am only one of the several other bloggers, who have tried and tested their hosting service, and I strongly recommended it to others as well. Bluehost has a proven track record of being one of the top web hosting companies and continues to be so in 2018 as well. Moreover, it is recommended by WordPress itself, which speaks volumes about its reliability and popularity. And if you register with Bluehost using our link, you can start your own blog at the lowest possible cost of $2.75 per month. Now, wait – aren’t there other options for starting a blog for a little cheaper? You may already be thinking about Blogspot/Blogger as an alternative. But let’s just stop you right there. It is often a bad idea to go for Blogger if you ever want to actually earn money through your blog. Most companies and advertisers turn away from these websites and do not consider them as professional as the self-hosted WordPress blogs. I have discussed in detail about what platform (Blogger or WordPress) is the right one for you in another post. You can always check that one out if you want to know more. But, to summarize, if you really want to turn your blog into a money-making business or a freelancing career, you must get self-hosted WordPress blog and pay for your hosting through tried and tested services such as Bluehost. Besides being unbelievably cheap, they also provide you a FREE domain, and you can always run your own advertisements, affiliate links, or direct advertising through the blog running on Bluehost. Bluehost makes creating a WordPress blog super easy. Just follow through this article and you’re good to go! Bluehost also offers technical support. Bluehost allows you to save more money, and, thus, make more money. They are cheap. You can start a blog at an affordable cost of just $2.75 per month if you sign up using our link. Bluehost gives you a FREE blog domain. You can monetize your blog. Being self-hosted on Bluehost rather than Blogspot makes you will look professional to other parties whether your audience, readers, companies or clients. Hurry up, then – click here to start a blog on WordPress, and follow the simple steps given below to create your own blog on WordPress without a single hassle. You can click here to purchase a domain name and start your own blog, and then follow the simple steps given below. Remember: Your domain name is probably one of the most important decisions you’ll ever make while starting your own WordPress blog on Bluehost. So give it a good thought and remember to go for a name that’s memorable and easy to recall. Most bloggers regret later on by choosing a name that’s either too long or too confusing which creates a lot of difficulties while explaining it to others. With Bluehost, you can directly get your domain and simplify the entire process by a greater degree. You can also enjoy a FREE domain for the first year if you buy 12 months worth of Bluehost web hosting. That’s why we highly recommend you to sign up for at least 12 months of hosting to save a great chunk of your money and to reap the more benefits. Buying 12 months of hosting also ensures that you get cheaper monthly rates, which means that the free domain that you get is simply an added bonus. Similarly, purchasing a 36 months plan yields even better value with cheaper monthly rates over the long run. So you can simply choose the deal that suits you and benefits you the best. Now, if you have decided to get your free domain, let’s get to the next step to buy your hosting along with the free domain from Bluehost. The “Basic” package should be enough for you, so you simply click on it to start. It’s easier than you think to set up a WordPress blog on Bluehost. Choosing “Basic” plan is the cheapest way to start a blog. If you sign up using our link, you get a discount and it will cost you only $2.75 per month if you sign up for 36 months, and only $3.95 per month for 24 months. Or, you can get 12 months plan by paying $4.95 per month. This would be a great plan to choose if you are still unsure about blogging. And… as you still get a FREE domain at this price using our link, this is definitely a great deal. If you go for a 12 months plan, your yearly cost would still be just $59 a year – can you believe that! 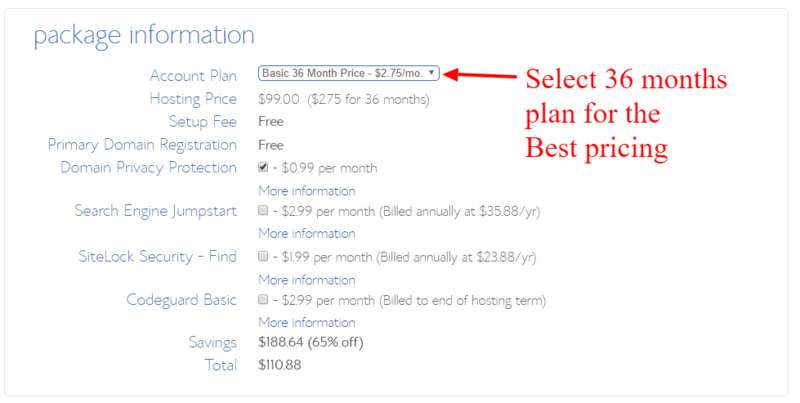 Additionally, you also get the domain name for FREE and save more money if you purchase 24 months or 36 months plan. Frankly, the “Basic” plan is more than enough for you right now. So just ignore going over the more expensive Plus and Business Pro plans. If ever you feel like you might need these plans, you can always easily upgrade to these plans by paying the additional price – so why pay extra money right now at the beginning? Paying a small amount of money for Domain Privacy Protection is also a good idea. It costs only $0.99 per month and ensures that your contact information stays safe. You can comfortably do away with all other additional items that Bluehost sells, so make sure to uncheck all the extras that might be listed in your plan. If you sign up using our link, you can get your domain for FREE if you purchase 12 months or longer plan. 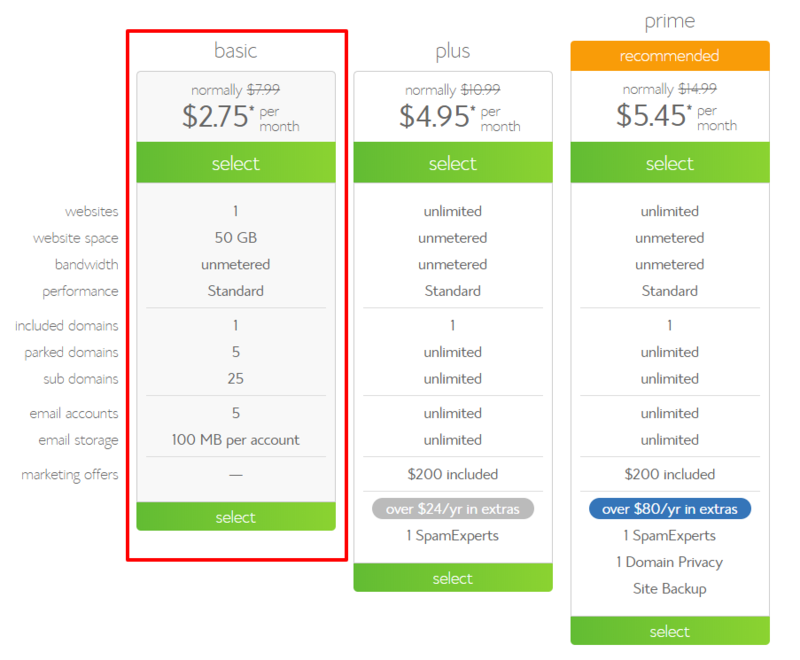 Remember: it is highly recommended that you purchase at least a 12 months hosting plan if you don’t want to end up paying more money. Not only is paying the cost every month a more redundant and ineffective process, it is also expensive and devoid of several benefits. Signing up for 12 months or more allows you to receive a FREE domain name, reduce your overall cost over the long run, and save hassles of renewing your website after the completion of each month. Just think about this: what if you forget to renew the hosting? Or, maybe your card expires just at the wrong time? Would you really risk losing valuable traffic and visitors on your page over these minor hiccups? It’s simply more effective and cost-saving to pay for more years at once. You can get a year of blog hosting at just around $59. For 3 years, it’s $99, and it’s still a great price if you consider all the benefits. If you really want to get the best value out of your money spent, remember that purchasing a 36-month plan is the best. If you purchased your domain directly through Bluehost, you can skip this section and move on to step no. 4. If you bought your domain from other providers, this is the time to connect your domain to your hosting account. Now comes the part where you actually start a WordPress blog on Bluehost. Bluehost actually makes it a lot easy to create a WordPress blog – and, that too, for FREE! Once you’re done creating your password, Bluehost gives you an easy guide on how to start a blog. First, you will be requested to choose a theme for your blog. Select the one you really like or the one that best fits your blogging needs. Remember, you can always change your theme later on so you can skip this step for now. Or, take your time and explore some of the most beautiful WordPress themes. You can always use one from a wide collection of beautiful themes from our Blossom Themes. Or I would also recommend giving Genesis and Rara Theme a try. All of them are easy to use and effortlessly customizable, so feel free to explore these several stunning WordPress themes collections. Congratulations! Your WordPress blog is now ready! Now you can get on with the fun part of choosing a great design and high-quality content for your own WordPress blog. You will receive an email upon completing above mentioned steps. The email will include your login details (WordPress login URL, username, and password). Use the details to sign into your WordPress account and keep the email safe for future purpose. Looking for a way to send newsletters or emails to your readers? Try out Drip, which is one of the highly recommended ones. Want an amazing design and a visually appealing look for your blog? Just go to “Appearance” on the left-hand side of the screen and click on “Themes.” There you may select from several free themes for your blogs. Or, you might want to try more easily customizable themes like a stunning collection of our Blossom Themes. You can also go for other impressive themes like Genesis and Rara Theme. All of these are easy to use and simple to customize, so explore these beautiful themes collections and then choose and activate the one you find the best for your blog. So there you go. I hope you are now fully aware of why it is a better idea to have a self-hosted WordPress blog and how to start your own WordPress blog using easy services like Bluehost. Not only does it save a lot of your money, but also help you monetize your blog in a big way and make handsome earnings on very little investment. So why not get started then? The sooner the better! Just sign up using our link to start your own blog at a discounted cost and enjoy the blogging life! Starting a blog is relatively easy. Making money off it… well, not so much. To start your own blog, all you have to do is get a domain, a good hosting, and create your blog on premium blogging platforms like WordPress.org. I have discussed this in detail in my post How to Start a WordPress Blog. You can follow the easy tutorial given there and even buy the hosting with Bluehost through our link at discounted prices. Or, to be more specific: Making ENOUGH money so that you can finally say goodbye to your day job and earn a full-time income online. Well, most people think that way. And the result: They never give blogging a proper chance of becoming a full-time career. They do not commit for long enough or put in enough effort. And to worsen their case: Many articles on the internet only talk about how lucrative this career is WITHOUT actually talking about the kind of effort, long-term commitment, proper planning, and patience that is required. If you invest the right amount of time and effort, if you are committed and dedicated, AND if you’re smart enough – you too can make the dream of earning millions through blogging a reality. To prove it to you, I am today going to present a list of 21 bloggers who are making thousands of dollars every month through their blog. I’ll introduce you to these superstars of blogging and tell you about the amount of money they make, their websites and niches, the monetization techniques they use, products they promote, and other important details. Together, we’ll try to learn the secrets of their success so that you too can begin your own journey of creating a money-making blog. Spoiler: The secret is that they are SMART (no, I don’t mean high-IQ-smart!). We will talk about the definition of smart and how you too can be a smart blogger later in this post. Eofire.com has been earning money since October 2012. John’s blog, Entrepreneurs On Fire, made a revenue of $69,879 with a net profit of $26,143 in its first year. Eofire.com has grossed over 12.5 million dollars at the time of this post. John made a whopping revenue of $595,936 in Feb 2016. John started with making podcasts for inspiring new entrepreneurs and now sells his own products, mostly online courses and ebooks. John has produced over 1900 episodes of podcasts where he interviews aspiring and successful entrepreneurs. You can learn a lot about running your own online business in the podcasts. The main source of income for John is his podcasts and books. His books, courses, and podcasts membership account for his main income. John earns a commission for promoting products. His major expenses are advertising costs for his products and hiring virtual assistants. He spent $11.5k on sponsorships and $9k on virtual assistants. John is the pioneer of podcasting among entrepreneurs. If you can talk, podcasts can be a fun way to make money online. The advertisement money on podcasts is really good. You can also learn a great deal from the interviews. It’s a win-win tactic. You create your content while you learn from the experts. If you visit Eofire.com, you will notice that the whole tone and theme of the website is unanimous. John focuses on maintaining his brand. Branding your website can help you gain the trust of the sponsors. You can land plenty of sponsors if you focus on branding. Pat Flynn is renowned among many aspiring bloggers. He has been an example of continuous dedication. He has been blogging for more than 8 years now and he shares all of his journey on his blog smartpassiveincome.com. The main theme of Pat Flynn’s blog is to teach people easy-to-use techniques for running an online business for passive income. He is truly inspiring. If you want to run a successful passive income blog, Pat can teach you proven strategies. He has also created a Podcast player if you are interested in podcasting. Pat primarily earned from Bluehost affiliate, ConvertKit, and other email marketing tools. He also earned around $22.2k with a referral link to a book called Best Year Ever by Michael Hyatt. Pat’s main source of advertising income came from the podcast sponsorship and some from Google ads. About $41.8k of the product sales revenue was from his course Power-Up Podcasting. Pat spends most of his revenue for professional services like developers, writers, and assistants. If we look at the income report of Pat, we can see ups and downs but he never stopped. He has been consistently blogging for more than 7 years. It is because of his dedication, he earned more than 2 million dollars in 2017. Like John, Pat also posts pictures of himself on his blog. You can get your own fan following if you build your personal branding. He once even wrote about how a reader recognized him on a flight. He felt like a celebrity which only entrepreneurs who focus on personal branding achieve. Pat has always diversified his income source to multiple platforms. From his blog to Podcast to YouTube channel, he has turned them into his income source. The benefit is that you can receive a huge amount of traffic and revenue, and you will also build your personal brand. You can learn more in detail about how you can create multiple sources of income in my previous post How to Make Money Blogging. Michelle Gardner is known for her blog Making Sense of Cents. The blog is about being frugal and learning to save for a better life. She teaches her readers that saving money and managing your finances can change your life. Michelle started the blog because she wanted to improve her finances and keep track of her progress so that she can teach her readers how to improve their finances. She managed to pay off her $38000 student loan in 7 months through online business. She writes in-depth articles about earning extra income with side hustle and controlling emotional spending. Bluehost web hosting was her major affiliate income source. Michelle posts sponsored contents and places adverts on her blog for extra income. Making Sense of Affiliate Marketing Course brought her nearly $50k dollars in December 2017. Being a blog about saving money, Michelle’s expenses are very low. She spent only $7,983.85 in virtual assistants, technical assistance, and other maintenance fees. Many people struggle with debt reduction, credit cards, and income management because they are complex topics. But, Michelle was able to explain the solution to the financial misery in simple language. She was able to target a large audience in a short period of time by helping them manage their finance. Michelle identified her audience – millennials that were struggling with student loans – and wrote content to help them reduce debt and earn income with side hustles. She focused on small group and wrote relatable articles. If you want to know more about finding your target niche, I have discussed this in detail in Point #7 of my post 7 Blogging Mistakes to Avoid in 2018. PinchofYum.com is a giant food blog that talks about recipes. Lindsay Ostrom prepares delicious food, takes pictures of them, and writes recipes along with the pictures. She has managed to make six figures by doing food photography. It was something that no one before her thought could be such a high earning niche. She has been an inspirational blogger for food lovers. She gets tons of traffic from Pinterest and Instagram and has over 550k Instagram followers. Major sources of traffic on Lindsay’s blog. Lindsay gets most of her affiliate income from Bluehost and Amazon. Advertising is the major revenue source of pinchofyum. She earns about $22.5k from sponsored content. Lindsay has a book called Tasty Food Photography where she teaches readers about taking good food photos. About $19.5k is used as salaries for staffs and contractors. Besides salary, studio-related costs are Lindsay’s major expenses. Lindsay brings over half a million traffic from Pinterest. And, because of her Instagram followers, she also gets a lot of direct traffic. So, you shouldn’t miss social media if you want tons of traffic. If you have an image focused blog, it’s better to use image-focused social media. Lindsay’s life changed when she started taking better photos. She even sells her own course about taking good food pictures. So, if your niche is related to images, you better take a photography lesson ASAP. There are also several other mistakes regarding the use of visuals in your blog post, which I discussed in detail in 7 Blogging Mistakes to Avoid in 2018. Lindsay’s blog has been going strong for over 6 years. The number of years matter. She has had so many posts with so many pictures that every time she creates a new post, it multiplies her traffic and income potential. Justin Weinger bought SoOverThis in 2013 from Andrea who wanted everyone to get “so over” the rate race, debt, and financial irresponsibility. The blog doesn’t claim to be a guru for financial advice. Actually, the blog believes in learning from the mistakes and correcting them, not only financially but in other areas of life as well. Justin shares his own journey from when he worked a full-time day job to gaining financial freedom by being as transparent as possible. Major sources of traffic on Justin’s blog. Justin doesn’t earn from affiliate marketing. Ads are the main source of revenue for Justin. Justin doesn’t sell any products. His major expense is share split between his partners, writers, and technical services. Advertising is the oldest legit money making method that exists. So it’s time you stop fixating yourself only on affiliate marketing and make thousands of dollars every month using ad sales through your high-traffic, authoritative website. What AdSense makes up in being easy, it gives up by not being lucrative. When advertising, make the most use of display ads (e.g. banner ads) and private ad revenues; AdSense can stay to help you fill up unsold inventory on your website. ShowMeTheYummy is a food photography website run by a couple, Jennifer and Trevor. Trevor is a professional photographer who now works on websites, marketing, and videography. Jennifer started food blogging while Trevor was working a full-time job. It was later Trevor worked on the blog full time. The site has been really impressive. The site was making only $28 in Nov 2014 and have been growing ever since. Jennifer shows her page views and RPM on her income reports, which is really admirable. You can learn all about how to properly monetize your website from ShowMeTheYummy. Major sources of traffic on Jennifer’s blog. Jennifer earns a tiny amount of her total revenue from Amazon Affiliates. Ads and sponsored content are the main source of revenue for Jennifer. She makes $14,311 just from AdThrive ads. She earned a significant amount of money from her video workshop. Jennifer’s expenses aren’t much since her husband helps her in technical aspects. Most of the expense was for the equipment she used for videography and photography. Increasing her RPMs from $3 to a whopping $65, Jennifer managed to earn $46,000 instead of $2,000 had her RPMs been the same. Jennifer goes a little bit outside her niche to extend her services and earn more profits. She talks about food photography and food videography on her blog instead of just food recipes. Abby blogs about DIY, home organization, and home decor. She focuses on the small things that we miss when we organize our home. She has been teaching her readers how to make their home look beautiful while also enjoying DIY projects. Abby has been able to make whooping $35k per month in just 3 years of starting her blog. When she first released her income report in Feb 2014, she was making around $2k. She then shared a goal of making 10k next month and surprisingly managed to make $13,887. New posts are updated multiple times a week in JustAGirlAndHerBlog.com. She writes about simple things but in great detail. Abby has her husband help her full time. So, according to her, the blog isn’t just a girl and a blog. Major sources of traffic on Abby’s blog. She earns money through multiple affiliate programs like Bluehost, Siteground, and Flywheel for Hosting, ConvertKit for internet marketing, and other web services. Abby doesn’t list any income from ads or sponsored content on her blog. Abby has a fan base so she earns a great deal by selling eBooks and courses. Abby pays around $1.7k as affiliate payouts which is her largest expense. Besides that, her major expenses include virtual assistants, accounting, and consulting fees. Abby writes about home decor and DIY and her major audiences are moms. And, she has maintained a feminine theme on her blog. This works great for her audience. So, when you consider branding your website, think about your readers. Instead of simply writing long posts, Abby uses a lot of pictures to create visual DIY guides. These are easier to follow and bring in additional traffic through social shares. Again, if you want to avoid some of the most common errors that people make while posting images, please read my previous post 7 Blogging Mistakes to Avoid in 2018. Abby writes in-depth posts on DIY topics and follows them up with listicles and roundups from across the internet. By writing a mix of authoritative and link bait content, she is able to get the best of both worlds: rankings and social media traffic. Harsh started Shout Me Loud in 2008 and has been posting his income report since Feb 2009 when he earned $434. He started blogging as an interest but when he found out he could make money, he started posting aggressively. The result is, he makes $39k per month. Harsh is one of those bloggers who gets a huge amount of traffic. He reports all his traffic stats in his income report. The blog receives more than 1.5 million pageviews. Shout Me Loud has blog posts ranging from tech tips to creating blogs. He is one of the few survivors of Google’s algorithm change. He also has a YouTube channel where he creates video guides about creating blogs. Major sources of traffic on Harsh’s blog. Harsh doesn’t list the major affiliate programs that he earns from. But, he surely earns a lot from affiliates. Harsh earns mainly from direct ad sales. He creates ebooks and sells them on his own store, Amazon, and InstaMojo. He reports about $8.3k as team expenses. Other expenses include consultation and technical fees. Harsh has been focusing on long tail keywords, which has allowed him to get tons of traffic from search engines. Long tail keyword is a full-proof method of getting more traffic from Google. Harsh has multiple blogs for different affiliate programs. For example, he has a separate hosting discount blog where he talks about web hosting. Harsh has been able to create a ShoutMeLoud brand by providing most of the commodity needed to start a blog through his different websites. It is best not to stick to just one or two method as there are so many ways you can monetize your blog. Matthew writes about Internet marketing, link building, traffic generation, and SEO. He publishes fresh high-quality articles and case studies. Matthew is regarded as one of the pioneers of Internet marketing. He has been writing about Internet Marketing and SEO since 2012. When he first published his income report in August 2012, he just earned around 600 dollars. The revenue has now increased to over $25.5k with total lifetime earning of over million dollars in just 5 years. Affiliate marketing is his major source of income while he also does consultation session now and then. Major sources of traffic on Matthew’s blog. He earns a tiny bit of his income from his blog ads. Matthew sometimes sells consulting services but he hasn’t taken any clients since last years. Matthew spent about 1.8k dollars in Facebook advertising which was used for developing a case study about the Facebook lead generation. Unlike our other top bloggers, Matthew doesn’t earn through his own products or even ads. He is an example of how effective affiliate marketing can be for making money online. Although he only writes about SEO and Internet Marketing, he promotes as many good products that are suitable for the readers. The advantage? Even if the audience doesn’t like one product, they will another. Matthew only writes about SEO and Internet Marketing. He has been doing so for a long time now. So, he has established himself as the leading authority in the niche. FatStacksBlog talks about making “fat stacks” through niche sites. Jon shares his lesson about creating successful niche websites. As reported as Jon, he made 28k dollars in his first income report of June 2016 and has been making a similar figure ever since. Jon doesn’t disclose his income sources nor does he talk about his monetization methods. However, he is mainly engaged in B2C and B2B affiliate marketing. John does give a vague idea about his monetization method, his traffic, content volume, revenue pattern, and his audience. But, nothing much can be concluded from those. Major sources of traffic on John’s blog. Jon’s sites bring in affiliate revenue from different sources. Jon sells a course but does not include that revenue in income reports. Jon doesn’t reveal his expenses. Though, he invests a lot in bringing paid traffic. According to sources, Jon was spending a huge sum of money to bring in traffic. He then converted the paid traffic while also increasing his organic traffic. Spending money to bring in more money has been a model that has worked successfully for Jon. Jon’s content was so good that he made a profit even after bringing paid traffic. He is an expert on making proven systems and then boosting it with paid promotions. Gina Horkey sells services. She is a freelance writer. She is living proof that if you are good at something, you can make money, even if you don’t have much experience. Horkey Handbook is about becoming or hiring a virtual assistant. VA is the main source of revenue for Gina. She also writes for some well-known publishers. She was able to earn $6.5k/month in her first year of freelancing career. Major sources of traffic on Gina’s blog. Gena earns about 5% of the revenue from selling affiliate products. Gena’s ads income is nil. Gena earns 95% of her income from her freelancing services and products. She pays 22% of her income to affiliates of her own products. A shot at freelancing can change your life. Gina was able to grow from $0 to $6k per month within few months just by doing freelancing works. Although Gina was making good money from just freelancing, she decided to launch her own products. That decision helped her make 3 times more money than she used to make while freelancing. Kristen started Believe In a Budget in 2015 as a side hustle while also working a day job. She worked as a designer before giving all her time to blog. Believe In a Budget, as the name suggests, started as a budgeting and financing blog but Kristen later turned it to online money making a guide so that like her readers could also do some side hustles to manage their finances. Kristen made $66 when she posted her first income report. But, now is able to earn around 16k dollars per month. Major sources of traffic on Kristen’s blog. Affiliate products are her second largest revenue source. She has reduced ads on her website so advertising revenue getting lower for her. Kristen makes most of her money from her courses and products. She mostly has courses on Pinterest for blogging. Most of her expenses is paying her affiliates. Besides, that VA works and professional services ($1,665) also burdens her income. Like Kristen, you can also use affiliate programs to promote your own courses. Even if it is a small course, you can still use affiliates to reach out to more people and make good money. Rose promotes her personal brand with sites like roseatwater.com and rosebakes.com. She primarily writes about managing finance, family, and faith in one site, and food and cakes in other. She engages the user with her personal life and shares her experiences and experiments with budgeting. She has been able to get a good revenue by covering different niches. Major sources of traffic on Rose’s blog. Rose earns quite a bit from affiliate links. Ads are the major revenue source for Rose. Being a blog about frugal lifestyle, Rose tries to lower her expenses as much as possible. However, Virtual Assistants make up most of her expenditure. Rose uses a similar theme on all her blog across multiple niches. This type of personal branding has helped her get regular readers. Although Rose doesn’t have as much traffic as other bloggers who make revenue from ads, she has been able to generate impressive RPMs using ad optimization platform. Alexa started the blog as a way of recording her journey as a single mother trying to beat the cycle of paycheck-to-paycheck living. She started the site in 2012 after she got divorced. Now, she has over 150k monthly visitors. In her blog, Single Mom’s Income, Alexa shares her experiences and talks about how to make money with side jobs and freelance gigs. She also shares her income from freelance gigs on her income reports so as to inspire her readers. She covers topics about financial management and believes in a frugal lifestyle. Major sources of traffic on Alexa’s blog. She makes some revenue from sponsored post and ads from ad networks. Alexa provides freelancing services to her clients. If your little freelancing gig can contribute to your revenue, why not do it? Alexa works as a Virtual Assistant to supplement her income. Alexa practices what she preaches in her blog. When she talks about saving and budgeting, she talks from her experience. She tells her readers how she has managed to get away from debt by just spending less. Major sources of traffic on Dave’s blog. Dave reports no affiliate income. Dave doesn’t place ads or sponsored content on his sites. All of Dave’s revenue comes from these products. Social Media Marketing and Writers are Dave’s major overhead. Give basic things for free and people will pay for advanced features if they like the free one. This model works for Dave and has been working for big corporate giants that sell SaaS. Dave managed to earn much more when he changed the design of this readability website. Dusty Porter is an online content creator and voice actor. He has a YouTube channel called TechnologyGuru with over 200k subscribers. He mostly makes money from YouTube channel, affiliate links, and podcast sponsorship. Dusty started looking for making money online after he was laid off from his 9-5 job in 2011. Since then, he has done everything from selling on eBay to selling voiceovers on Fiverr. In the blog, Online Business Realm, Dusty produces podcasts where he interviews entrepreneurs and basically talks about creating and managing a profitable website. He promotes services like Bluehost and earns a fourth a revenue from affiliate products. His major form of income from ads are display ads and sponsored posts. Dusty sells his own courses and does Freelancing Gigs on Fiverr. He pays fees for Upwork Virtual Assistant and other technical services. Dusty’s expenses are quite low compared to other bloggers. Dusty has his hands in diverse areas from YouTube to Fiverr. So, he not only diversifies his traffic but also his platforms. All of Dusty’s gigs bring in money. If you think you can monetize things, do it immediately. Spencer Haws is pretty famous among internet marketers. He is an online entrepreneur who has made multiple six-figure-earning websites on his own. One of the most popular sites of his is Long Tail Pro. He also has Amazon FBA business. However, this income study is about nichepursuits.com, where he is trying to build a niche website from scratch while also sharing the results with the readers. You can find many case studies and advice on building, buying, and monetizing website on the website. There’s no graph because Spencer doesn’t have enough income reports of NichePursuits.com as he only just started keeping the income records. Major sources of traffic on Spencer’s blog. Spencer makes all of his money on NichePursuits.com through affiliate products. Spencer doesn’t report any advertising revenue. Spender’s other products and services are not included in niche pursuits. Spencer doesn’t reveal his expenses in the income report. However, his major overhead would be Virtual Assistants and technical services. Spencer has a lot of websites and projects so he found outsourcing a good way to grow his overall business. He gives the responsibility of content creation to others so that he can lead and do marketing. Matthew makes HTML5 games and sells them through his website TrueValhalla.com. He designs the games from scratch and sells the rights to gaming portals for royalties. Matthew is an example that there are multiple ways to make money online. You just have to do what you like and are good at and people shall find you. When people find you, money finds you. The earnings from Matthew’s website is a rollercoaster, sometimes they are as high as $30,000 in a month and sometimes it’s as low as $3,000. But, despite these fluctuations, Matthew is happy that, at least, he has financial freedom. Matthew earns a little from website ads. Matthew sells his own products and consulting services. Making HTML5 games and selling them to gaming websites is a fresh and nice little niche so it has less competition. This has helped Matthew easily earn big bucks with less marketing efforts. So, if you have fresh ideas, go ahead and try them. Become the authority figure in your niche. Narrow niches create more chances of becoming the authority in competitive markets. With the mission to provide free, evidence-based information and parent-approved tips on everything related to baby care and pregnancy, Paula created Easy Baby Life in 2006. With a continuous dedication of more than 11 years, the site has become an authority in the niche. The website receives more than 500k pageviews per month. Paula, being a mother of two, shares her experiences as a mother and gives tips and medical advice (from real doctors she has listed on her website) to new mothers about parenting. Major sources of traffics for Paula’s blog. Amazon affiliate is the major source of her affiliate income. Paula does not sell any products or services. Her expenses are the cost associated with managing and maintaining the website. Paula has dedicated over 11 years on a single website. She truly has a passion for what she blogs about. Because of her passion, she has become the authority of the niche and get tons of search traffic which bring her whooping ad revenue. Paula has started learning about Social traffic and Affiliate marketing. She already gets a lot of organic traffic. Now that search traffic is working, she is looking at other methods of monetization. Nathan started Income Bully to track his own progress with the whole make money blogging things and affiliate marketing. In this process, Nathan has been able to create some extraordinary posts on blogging, entrepreneurship, and local SEO. Nathan’s biggest motivation for creating the blog was the fact that big players in the industry were screwing people just for selling their courses. So, he wanted to create a blog that shares information for free. Income Bully is Nathan’s journey to creating a passive income source. He runs an offline web agency business. So, if you are planning to create a blog for a passive source of revenue, you should definitely read his posts. Major sources of traffic on Nathan’s blog. A slight amount of revenue comes from the referral links. Nathan earned $550 from two coaching sessions and $1,544 from his course about running an offline agency. With only 4600 visitors, Nathan was able to pull off $2200. How? He sold his own products. The benefit of selling your own product is that you can set your price and you only need to get targeted traffic. Will is a new player in the travel blogging who has been posting his income report since Nov 2014. Travel Blog Breakthrough is a website dedicated to readers who want to become a digital nomad themselves. In one of the most competitive niche, Will has been able to see some huge profits in a short amount of time. Besides normal posts about travel blogs, he also produces podcasts. Major sources of traffic on Will’s blog. Will earns a decent amount of money with affiliate links. Sponsored Posts and campaign is the major revenue source for Will. Will does some freelancing writing gigs. Cost of marketing tools like BoardBooster and Aweber are Will’s main expenses. Will has been monetizing his blog right from the first day. He tried freelance gigs, sponsored contents, and affiliate programs without waiting first to get some solid traffic. Not monetizing the blog right from the start is one of the most common mistakes that beginning bloggers make. So, think and plan about the finances early on. The Createandgo.co team has been earning money blogging since 2015 with their first blog Avocadu.com. Avocadu is their health and wellness blog that made $103,457.98 in its first year! After growing that blog to $10,000/m, they decided to teach other bloggers how to make money with Create and Go. Founded by Alex and Lauren (a former personal trainer and CPA), in 2018 they earned over 1.66 million with a little less than $600,000 in expenses putting their blogs at over the million dollar mark in revenues. Their books and courses are their main source of income. Their major expenses are advertising costs for their products and virtual work. One of the staples of how they get their traffic, fans, and buyers is through the social media site Pinterest. They personally drive over 200,000 monthly visitors to their blogs through Pinterest alone as a traffic source. An interesting detail about Alex and Lauren is that they made a six-figure blog BEFORE teaching other people how to do it. They coach and share the strategies they learned online monetizing their other blogs. They are not just bloggers blogging about blogging. 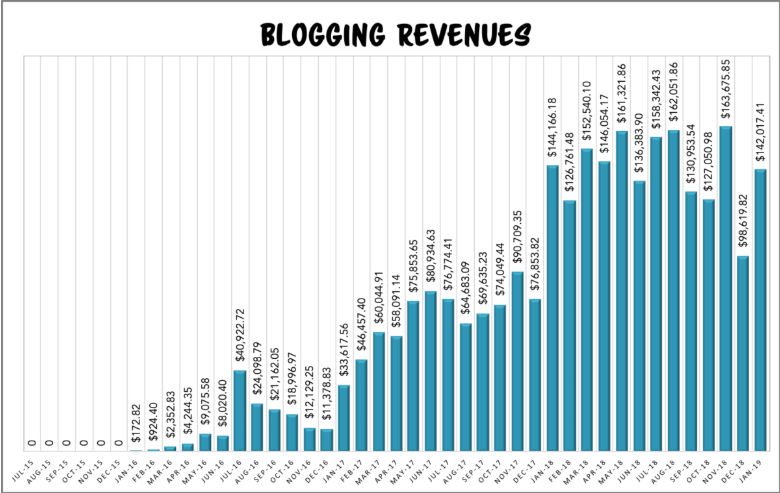 The bloggers I listed above are from diverse niche, but they are all making a really impressive amount of money. So is there some common ground among the things that these bloggers have been doing? I think yes. And their (not so) secret is that… all of them are SMART. As I mentioned at the beginning of my post, I don’t mean to say a high-IQ-smart – but that these bloggers are doing the basics right and thinking creatively. They know almost everything about their niche. If there’s something they don’t, they have it in their reading queue. They can take complex ideas and talk about it in a simple language everyone can understand. They captivate you on their posts. You will keep their article as a reference for future – you will bookmark it. Now, like any other skill or expertise, developing these kinds of blogging abilities also requires dedication, consistency, hard work, and patience. Then you too can become a smart blogger. If you want to grow, you need to always look for people smarter than you. You will learn more when you change your friend circle. It will also be easier to lose your old habits when you go away from your old friends. No. We are not saying to ditch your pals. What we are trying to say is that if you spend 3 days a week with your friends, make it once a week and use that extra time to invest in yourself. Create new effective habits. Become proactive and set goals. Read. Read. Read. Become a know-it-all. Watch random YouTube videos and tutorials. The benefit of knowing it all is that you can relate one subject to another and will be able to better explain to other people. When you read a lot, you will have access to vast content and a power to explain things in layman terms. This learning habit will make you ready for exploring deep into your niche. You will be able to create original posts and ideas. Popular blog posts don’t just happen. Smart bloggers spend a lot of time thinking about it before they actually write the post. The pre-writing brainstorm is what makes a masterpiece. So, start to think about your writings. Have an article that you want to write? Think about it for hours before you open the Word Processor. If you plan to write for 10 minutes, think about what you will write for one hour. It will take your content to the next level. I began my post by telling you that making money online through your blog is not that easy. But the fact of the matter is… nothing ever really is! Well, not in the beginning at least. You have now seen it for yourself how so many bloggers are earning thousands of dollars online every month. But here’s the catch: I have no doubt that it was just as difficult for them when they first started out. You, on the other hand, have an advantage. You can now pick valuable lessons from their success and use it to build your own. Let’s be honest, it will be a while before you start making six or seven figure income with your blog. But if you do the basics right and keep doing it for a longer period of time, it WILL happen sooner than you think. Take that first step toward your blogging success by starting your own WordPress blog today. It’s a long way to go, so the sooner you get started, the better.